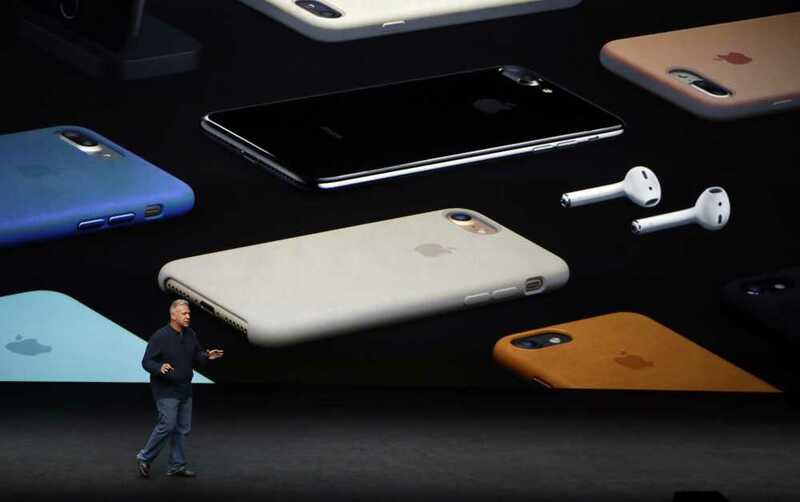 Phil Schiller, Apple's senior vice president of worldwide marketing, talks about the pricing on the new iPhone 7 during an event to announce new products Wednesday in San Francisco. SAN FRANCISCO -- Apple's latest iPhone may be more notable for what's missing than what's been added, as the consumer tech giant tries to revive demand for its top-selling product and nudge consumers closer to its vision of a wireless world. The iPhone 7 and 7 Plus unveiled Wednesday come with a faster processor, longer battery life and better cameras -- including a new dual lens system in the pricier 7 Plus model that provides higher-quality zooming. But the new phones won't have the analog headphone jack that's been a staple for decades in just about every consumer electronics device that can play audio. Apple is betting its legions of loyal fans will embrace the shift to digital headsets that use wireless connections. Or -- if they insist on sticking with their old ways -- that they won't mind using a new style of earbuds that plug into the iPhone's "Lightning" charging port. The redesigned earbuds -- with cord -- will be included with the new iPhones. Also in the box: an adapter that will let older headphones plug into the digital charging port. But Apple would clearly prefer to push consumers to make the leap into what it envisions as a "wireless future." As part of the transition, Apple also is introducing wireless AirPods that will sell for $160. They're powered by an Apple-designed processor and special software Schiller said will let users easily sync the wireless buds to their iPhone, Apple Watch and other Apple devices. Apple also is promising a new line of high-end wireless speakers from its Beats division. Getting rid of the 3.5-millimeter headphone jack helped Apple make room for a second iPhone speaker designed for playing stereo sound. The iPhone 7 also is water resistant, a popular feature that rivals such as Samsung Electronics have introduced in some phones. Schiller portrayed the move to drop the headphone jack as a step toward improving user experience. "It makes no sense to tether ourselves with cables to our mobile devices," he said during the company's annual fall event. Apple previously reduced the number of ports in its popular line of MacBook computers while encouraging people to use wireless services for transferring files and streaming data. By promoting wireless ear buds, analysts say, Apple may also hope to get more people using streaming services on the Apple Watch as well. The company is trying to reverse its first decline in iPhone sales since the company's late founder, Steve Jobs, unveiled the trendsetting device in 2007. It also has seen a drop in demand for the Apple Watch since its introduction last year. Apple delivered virtually all the features that had been promised in news leaks over recent weeks, but analyst Bob O'Donnell of Technalysis Research said the changes from last year's iPhones were "modest" overall. The dual-lens camera in the iPhone 7 Plus may be impressive, he said, but it's available only in the larger and more expensive phone, limiting its appeal. Other smartphone makers also are having trouble dazzling consumers with new advances. But Forrester Research analyst Julie Ask figures consumers will appreciate the faster chip and other improvements once they try the new iPhones. And she's not worried about any backlash over elimination of the hardware jack. "Apple has a very long history of removing features we all thought were necessary and then convincing us that we didn't need them," said Ask, noting Apple paved the way in phasing out the use of floppy discs and optical drives in computers. "Three months later, it will be, 'Why did we ever have that?'" The new iPhones will debut Sept. 16 in the U.S., China and more than two dozen other countries. Orders will start Friday. Older iPhones also will see improvements this fall as the company releases its latest mobile operating system version, called iOS 10. It will be available as a free download beginning Sept. 13. Among other things, the software will add more intelligence to Apple services such as Maps, Photos, the iPhone keyboard and Siri, the voice-activated digital assistant. The Apple Watch will get a popular new app later this year too. Niantic Labs, the maker of the cultural sensation Pokemon Go, announced Tuesday the game will be released for the watch, building upon the apps it already has designed for the iPhone and Android devices.